We've sourced the most amazing honeymoon locations across the globe; whether you want to go somewhere classically romantic, luxurious, adventurous, exotic or stay at home under the Southern skies, we've found your dream destination! Choose from a Classical Parisian or Art Deco styled suite with pristine views of the Eiffel Tower and the glistening city. Dine at some of the hotel's five different restaurants, relax in the Dior Insitiut day spa and soak up the magical romance that only Paris can offer. Bon voyage! Famous as the most romantic honeymoon destination in Greece, Katikies Sun Rocks Hotel offers breathtaking panoramic views of the Mediterranean that span for as far as the eye can see. This couples-only retreat transforms at sunset when the whitewashed walls turn a beautiful golden shade to compliment the pink and purple horizon. Simply amazing! A five-star ivy-covered resort hidden amongst the vineyards of Italy's Brescia province, not far from Shakespeare's famous Verona. Splurge and go for The Cabriolet suite, which has a retractable ceiling over the bed that opens at the touch of a button to invite the starry, starry night into your honeymoon suite. This 15th century residence is an island that offers magnificent views of Venice over the water. Fin out why it's so famous by experiencing first hand interiors decorated in exquisite local artifacts, classic Italian cuisine with an modern twist and the most luxurious swimming pool in the city. Voted the second best resort in the world by Condé Nast Traveler Readers' Choice Awards, the Taj Exotica Resort and Spa is the perfect option for luxury overwater bungalows. The Ocean Suite has its own freshwater plunge pool, a glassed bathroom with an infinite view of the Indian Ocean and a private sand-filled suspension sundeck. Dine at a table on the beach or your butler can bring a gourmet meal out to your bungalow. If you're feeling active you can go waterskiing or kayaking, take a catamaran out on the lagoon or go diving with wild dolphins! Surrounded by beautiful pine forests and lake views this private Adirondack estate gives that cabin-in-the-woods escape with five star amenities and service. The Boathouse is a secluded luxury cottage on the pier that offers guests magnificent views and serene privacy. Located right on Lake Wakatipu, Blanket Bay Luxury Lodge offers an amazing alpine experience ideal for the adventurous couple. Get your adrenalin pumping by trekking, skiing, heli-skiing, jetboating, kayaking, fishing, horse riding, a trip to world famous Milford Sound and 4WD tours. Make your honeymoon even more special by taking a helicopter over the mountaintops to a secluded picnic location where you'll sip French champagne and indulge in gourmet nibblies. If curling up in front of an open fire while the snow falls outside on the mountaintops is your idea of romance, Aspen is your place! The St. Regis is styled like a 19th Century alpine manor with huge leather sleigh beds, warm crackling fireplaces and a world-class day spa. Spend the day on the slopes or dashing through the snow on a dog sled and then relax in the heated outdoor pool or by sipping on a nightcap and toasting marshmallows at Shadow Mountain Lodge. This palace is nestled in the rainforest and extends down to the beach is a sprawling myriad of jungles, beach, wilderness and fruit plantations home to horses, zebras, sea turtles and antelopes. Originally bought by Sir James Goldsmith as a personal palace, Cuixmala is now an eco resort popular with A-listers. The villas all feature their own private pool area and each casa has its own cook who can prepare whatever you want, whenever and wherever you want it. If you really want to be treated like royalty in a faraway place, this is definitely the place to do it! This luxurious treetop lodge on stilts sits in the indigenous forest canopy with panoramic views of mountainous jungle. This is just like Tarzan or Swiss Family Robinson except with sky-high wraparound porches, private infinity pools and secluded dining decks surrounded by trees. Relax after a hot bubble bath by wrapping yourselves in fluffy towels and sipping wine on your private deck. This literally cool hotel is made entirely of ice! You can stay all year round but we recommend wintertime when you can see the beautiful Northern Lights arctic sky show, visit reindeer and moose, go dog sledding and try your hand at ice carving. In the summertime, cruise down the Torne River in a canoe or raft. As the ice hotel itself ranges between -5° and -8°, we recommend combining one night's stay in the giant igloo with a few warm nights in one of the private chalets down the road. Only half an hour from world heritage site, Uluru, you'll stay in luxurious white tents completely surrounded by the natural beauty of the Northern Territory. Relax by treating yourselves to a couples massage treatment, taking a dip in the pool and indulging in a three-course meal under the open night sky. Located on the edge of world heritage listed Cradle Mountain-Lake St. Clair National Park, Pepper's Cradle Mountain Lodge is famous for offering luxury in the wilderness. Take a walk through the beautiful national park, sample local wines and cheeses and get the adrenalin pumping with tobogganing, horse riding, quad biking, helicopter flights, cradle canyoning or canoeing. 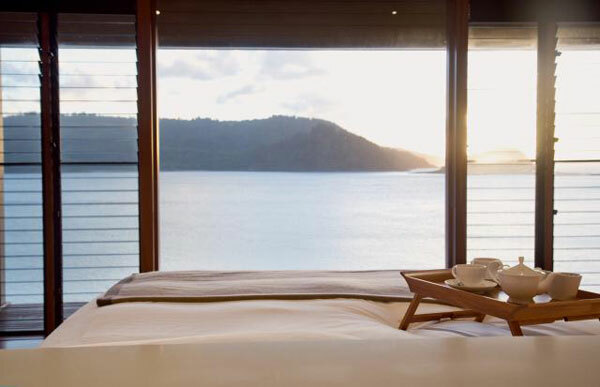 Voted best resort in the world 2012 Condé Nast Traveler Readers' Choice Awards, qualia is centred on channeling the natural beauty of the Australian natural environment. Stay on your own private luxury pavilion and relax on private sun decks and infinity plunge pools that overlook the sea.